Being leading of Producer of crude Palm oil, Indonesia has 27,3 million hectares oil palm plantation. Kristina Van Dexter as a speaker, actually came from USA by George Mason University. She talked about Environmental Science and Policy goes to Land Tenue, Land Partership also about Amazon Technology. 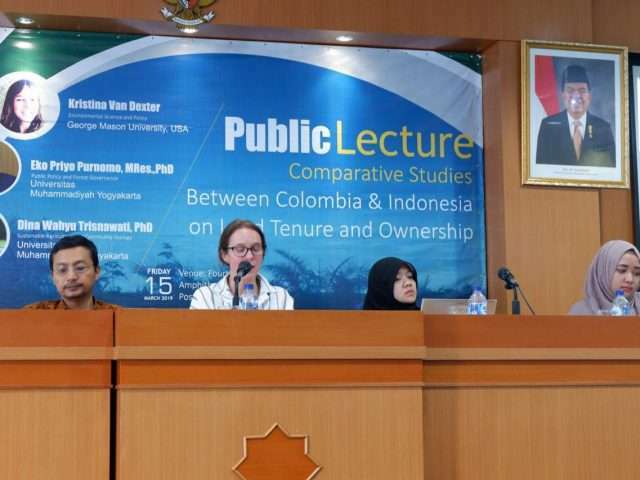 By her research in Kalimantan almost 6th month, she got more facts that in Kalimantan there’s Legal Agricultural Land used COCOA and Transmigration Program as Local Government Subsidies. By that policies, some companies can transform a natural forest into oil palm plantations. Beside researching about Kalimantan’s Land, she also research about how Indonesian Land Administrations as general policy, Land Conflict inside and Smallholder indebtedness. Second speaker goes to our Lecturer is Eko Priyo Purnomo, MRes.,PhD from Universitas Muhammadiyah Yogyakarta. He talking about Public Policy and Forest Governance in Riau Province. By his research, got a fact that many Riau’s forest transform into oil palm transplantations to up economic growth but damaged the environmental so far. Transformation method also becomes a problem because they use a burn forest method to expand the oil plantation land.